1 August 1933: his father Nakamura Fukusuke V dies. November 1933: he makes his first appearance on stage, at the Kabukiza, where he receives the name of Nakamura Kotarô IV and plays in the drama "Kiri Hitoha". 12 September 1940: his grandfather Nakamura Utaemon V dies. October 1941: Nakamura Kotarô IV takes the name of Nakamura Fukusuke VII at the Kabukiza. July 1951: revival at the Shinbashi Enbujô of Kawatake Mokuami's drama "Jitsugetsusei Kyôwa Seidan"; Fukusuke plays the role of the okujochû Kumemura [casting]. March 1953: premiere at the Kabukiza of Osaragi Jirô's drama "Edo no Yûbae"; Fukusuke plays the role of Otose [casting]. March 1954: revival at the Kabukiza of the dance-drama "Imayô Suma no Utsushie"; Fukusuke plays the role of the ama Murasame [more details]. December 1954: premiere at the Meijiza of Kawaguchi Matsutarô's revision of Chikamatsu Monzaemon's drama "Daikyôji Mukashi Goyomi", which is entitled "Osan Mohei"; Fukusuke plays the role of Otama [casting]. June 1963: premiere at the Kabukiza of Hagiwara Yukio's Nagauta-based dance-drama "Ôeyama Shuten Dôji"; Fukusuke plays the role of Lady Sawarabi [casting]. January 1967: revival at the National Theatre of "Narukami Fudô Kitayama Zakura"; Fukusuke plays the role of Princess Taema [casting]. April 1967: great shûmei at the Kabukiza for the Narikomaya and Kagaya guilds; Nakamura Fukusuke VII, Kagaya Fukunosuke, Kagaya Hashinosuke and Nakamura Tamatarô III respectively take the names of Nakamura Shikan VII, Nakamura Fukusuke VIII, Nakamura Matsue V and Nakamura Tôzô VI; Shikan's son Nakamura Kotarô V makes his first stage appearance. The new Shikan plays the roles of Omitsu and Princess Yaegaki in the dramas "Nozakimura" and "Jusshukô". May 1968: revival at the National Theatre of "Ura Omote Sendai Hagi"; Shikan plays the role of Masaoka [casting]. July 1968: revival at the Kabukiza of the drama "Kama-ga-Fuchi Futatsu Domoe"; Shikan plays the role of Goemon's wife Otaki [casting]. April 1981: revival at the National Theatre of Nishizawa Ippô's drama "Keisei Hama no Masago"; Shikan plays the role of Yodo-no-Kata [casting]. 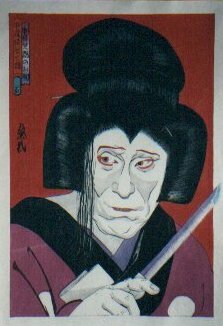 January 1982: revival at the National Theatre of "Zôhiki", a bombastic play in the aragoto style which belongs to the Kabuki Jûhachiban; Shikan plays the role of the widow Atago-no-Mae [casting]. 15 December 1989: Shikan joins the prestigious Japan Art Academy (Nihon Geijutsuin). June 1991: premiere at the Shinbashi Enbujô of Hagiwara Yukio's dance-drama "Sakuragawa"; Shikan plays the role of Somenoi-no-Mae [casting]. 1996: Shikan receives the prestigious title of Living National Treasure (Ningen Kokuhô in Japanese). November 2005: tôshi kyôgen revival at the National Theatre of the drama "Ehon Taikôki"; Shikan plays the role of Mashiba Hisayoshi [casting]. 10 October 2011: Shikan dies of lung failure in Tôkyô. Nakamura Shikan VII was one of the most talented and experienced contemporary onnagata actors and the only one being able to play the difficult role of Kakuju in the "Dômyôji" act of the play "Sugawara Denju Tenarai Kagami". Some members of the audience used to shout "Kamiyachô" during his performances - this was the name of his neighboorhood in Tôkyô and an original way to appraise this great actor. Nakamura Shikan playing the role of Ohatsu in the drama "Kagamiyama Kokyô no Nishikie"